We all know that the most popular breakfast options include bread, eggs, cereal, smoothies, parfaits, pancakes and fresh fruits. You’ve probably been eating them ever since you were a kid. If you’re getting tired of these routine and mundane dishes, I wouldn’t blame you. What if I told you that you could have delectable muffins for breakfast? 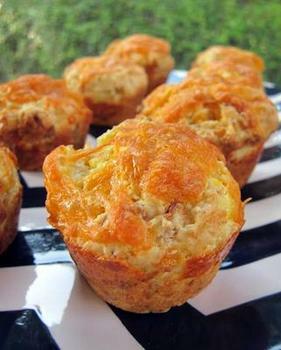 And these are delicious yet healthy muffins I’m talking about. I bet you wouldn’t be able to resist them. They would seem like something straight out of a breakfast café menu and give you a good, much-needed break from the traditional breakfast. 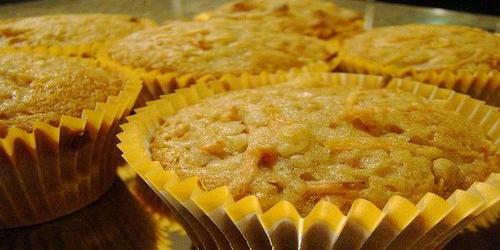 Here are a few healthy and tasty muffin recipes, which are good enough to start your day with. 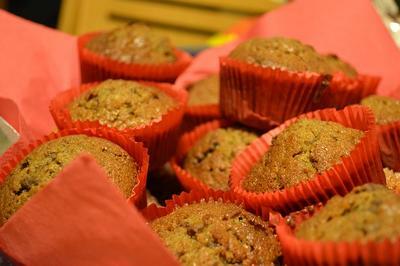 To make the muffins, mix together flour, sugar, baking powder, nutmeg and salt in a large mixing bowl (A). Make a well in the middle of this mixture and keep aside. In another bowl (B), add the egg, milk and melted butter and beat till they mix properly. Add this mixture into the well created in bowl A and stir until the ingredients have just combined. It doesn’t matter if the batter is slightly lumpy (applies to all recipes). Grease muffin tins/pans or line them with parchment paper. Spoon the batter into them. Bake in the oven for about 20 to 25 minutes. Prepare the topping by combining sugar and cinnamon in a small flat dish. Keep the melted butter handy. Remove the baked muffins from the oven. Let them rest for 5 minutes and remove them from their pan. 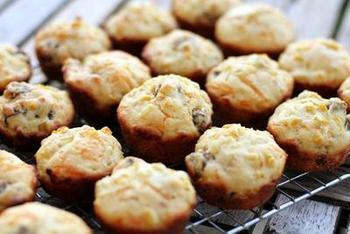 Dip the tops of the muffins in the melted butter followed by the sugar-cinnamon mixture. Serve warm. In a large mixing bowl (A), add flour, cornmeal, cheese, sugar, baking powder, baking soda, ground cumin and salt and stir. Add the bacon and the jalapeno and mix well. Create a small hole in the center of the mixture. In another bowl (B), whisk together egg, buttermilk and oil and add this to the well created in bowl A. Stir till they have just combined. Bake in the oven for about 15 minutes. Remove the baked muffins from the oven. Let them rest for 5 minutes and remove them from their pan to cool on a wire rack. Serve. Chop the sausage into bite-sized pieces and cook them in a skillet over medium heat until no longer pink. Drain. In a large mixing bowl, add eggs, onions, green pepper, salt, garlic powder, pepper, sausage and cheese. Mix well. Bake in the oven for about 20 to 25 minutes. Remove the baked muffins from the oven. Let them rest for 5 minutes and remove them from their pan. Serve warm. In a bowl (A), sift together flour, baking powder, baking soda and salt. Create a well in the center. Keep aside. In another large mixing bowl(B), add bananas, egg, sugar and melted butter and mix well. Fold this into the well created in bowl A and stir till the ingredients have just combined. Bake in the oven for about 25 to 30 minutes. 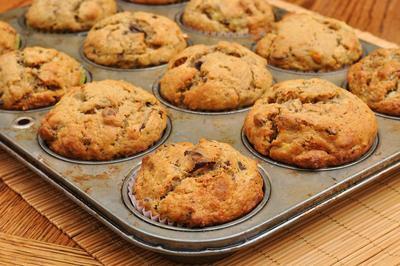 Remove the baked banana muffins from the oven. Let them rest for 5 minutes and remove them from their pan to cool on a wire rack. Serve. In a large mixing bowl (A), add flour, sugar, baking soda, baking powder and salt and mix well. Make a hole in the center of the mixture. In another bowl, mix together egg, buttermilk, orange juice concentrate and melted butter and add into the well created in bowl A. Stir will the mixture has just combined. Fold in the walnuts. Bake in the oven for about 20 minutes. Remove the baked muffins from the oven. Let them rest for 5 minutes and remove them from their pan. Meanwhile, prepare the drizzle by combining the powdered sugar, orange peel and orange juice in a small bowl. Drizzle this over warm muffins. Serve. Eating a healthy breakfast is important for your mind and body to function properly for the rest of the day. A lot of people equate healthy food with uninteresting and tasteless meals. But it doesn’t have to be that way. Try the above mentioned recipes to put an interesting spin on your mundane morning munches. After all, life is too short to be eating boring breakfast!